Explore the connections between the past, present, and future. 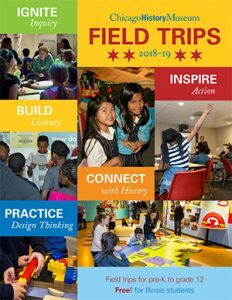 Field trips to the Chicago History Museum enable students to interact with artifacts, documents, works of art, interactives, learning stations, and more. See, hear, experience, and even touch history to develop an understanding of the past and how it informs our present. Sign up for a field trip to put historical analysis and critical thinking into action! Field trips are free for Illinois students (pre-K to grade 12) and align with national and state learning standards. Our Crazy for Trains discovery bags help your students delve into Chicago’s amazing transportation history through role play, manipulatives, read-aloud books, and song. Learn more. From activity stations to workshops, elementary students will use their senses to connect to the choices and challenges Chicagoans faced as their city grew and developed. Explore field trip options. Enjoy an audio tour or become a curator in our Facing Freedom workshop. Voice and civic learning are at the heart of our experiences for middle and high school students. Explore field trip options.